Falling in love and deciding to get married is a magical time for couples. This is true regardless of their age and any previous relationships they may have been in. However, while it is easy to get swept up in the excitement and romance of it all, there are some important issues older couples in general should address. In the weeks after your engagement and months before your marriage takes place, having your attorney draft a prenuptial agreement should be at the top of your to do list. Far from reflecting a lack of commitment or confidence in the relationship, this type of legal document can actually help to strengthen your marriage while ensuring both you and your partner are protected. 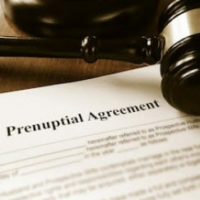 Under Section 61.079 of the Florida Statutes, a prenuptial agreement is a legal document which outlines each party’s rights and responsibilities when it comes to financial matters and any property or assets they possess. This includes the rights to buy, sell, use, invest, or otherwise control this property, which may include items such as real estate, income, business interests, and financial accounts accumulated or earned either prior to or during the relationship. One of the main advantages for any couple in creating a prenuptial agreement is it encourages open discussion about money, one of the leading causes of divorce and fights during marriage. Establishing in advance your attitudes about money and your intentions in regards to saving and spending can help avoid problems further down the line. Identifies and separates assets: In creating a prenup, each person will need to list all of the property and financial assets they possess. This allows for full disclosure and provides a clear picture of what is ‘mine, yours, and ours’ in the relationship. Ensure debts are disclosed: Rather than being surprised by a partner’s spending habits, a prenup allows you to deal with the situation before the marriage. In cases where one of the parties has racked up significant debts, it can prevent the other partner from having to assume these obligations. Protects inheritances: If you have children from a previous marriage or a former spouse who you intend to have a share in your estate, a prenup makes sure they are protected. Provides future security for the couple: A prenup can protect each person’s rights to property and assets in the event one of you becomes incapacitated or requires care in a nursing home. At the law firm of attorney Vanessa L. Prieto, we provide the legal guidance you need to avoid issues which could jeopardize your rights and impact your marriage. To request a consultation regarding your specific situation, reach out and contact our Fort Lauderdale prenuptial agreement attorney today.